Standard - $199.99 Only 1 left! Mace Windu is no ordinary Jedi. He’s a Master of the highest caliber, on par with iconic knights like Master Yoda. He’s the only known Jedi Knight to have mastered the lightsaber art of Vaapad, the most dangerous form of lightsaber combat in the Star Wars universe. He’s an exceptional Jedi and if you think he’s going to walk around the Jedi Temple with an ordinary lightsaber, then you’ve got another thing coming! Mace Windu wields the legendary amethyst colored blade. We’re not sure how he got his hands on that lightsaber, since most Jedi end up using the standard blue and green ones. If you want to get your hands on a purple lightsaber of your own, then you want this Star Wars Black Series Mace Windu Lightsaber. 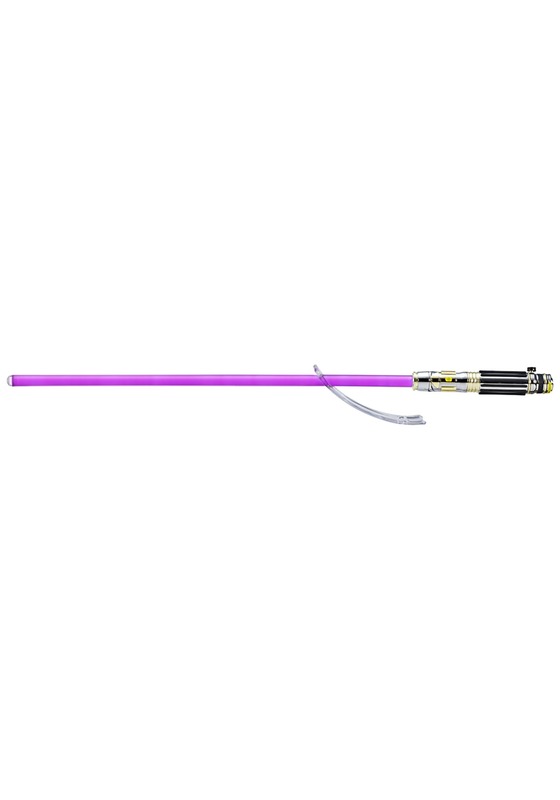 This officially licensed Mace Windu Force FX Lightsaber recreates the legendary weapon from the prequel Star Wars movies. The handle is silver with gold and black accents. The blade, when activated, glows a soft purple color. It makes authentic movie sounds and even comes with a display base for when you’re not using it to practice your Jedi lightsaber moves. If you want an extraordinary lightsaber to add to your Star Wars collection, then you don’t want to miss out on this Mace Windu Black Series Lightsaber!